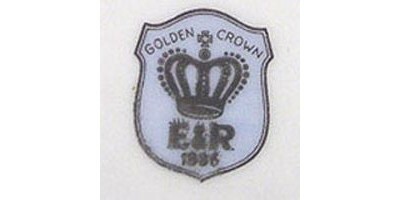 E & R Golden Crown- Zeh, Ebeling & Reuss Co. was established by the German emigrants Theodore Ebeling and Frederick Reuss which had teamed up with the owner of a glassware and china business, John E. F. Zeh. The company imported porcelain, earthenware, and ironstone from several Bohemian, Czechoslovakian factories and other European countries, including dinnerware, decorations, and gift items. Zeh withdrew from the company in 1900; it was renamed to Ebeling & Reuss Co. before moving to Devon, Pennsylvania. Bavaria Germany Jaeger & Co Golden Crown E&R Silver Glory Dinner Plate Manufacturer Stat..